The program is to start next Friday night. Please pre-pay this week. You may instantly pay with MasterCard or PayPal at this site: Ohaiv Yisroel Friday Night or click the image below. This week's Shaleh Shudos is being sponsored by Regina and Ernie Frenkel honor of the Bar-Mitzvah of their grandson, Refael Yaakov. Use our new PayPal account to make donations instantly. The button below takes you to our main donation page and from there you will be redirected to the pages which will accept your donations for the Library Project, Dinner Project or Aliyah donations. Sara and Rabbi Yechiel Yosef Gruenebaum on Menachem's engagement to Esty Susholtz. Naomi and Rabbi Dovid Greenwald upon the engagement of their daughter, Tova to Sruly Bernstein, the son of Gitty and David Bernstein. 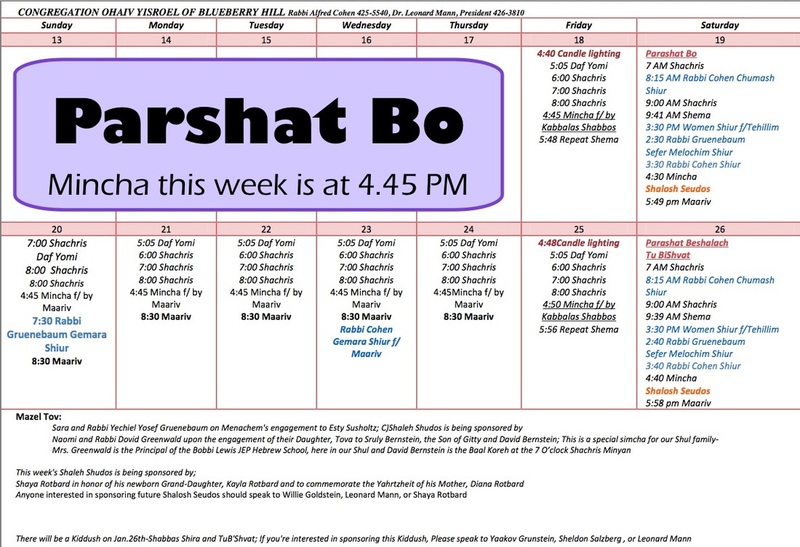 This is a special simcha for our Shul family - Mrs. Greenwald is the Principal of the Bobbi Lewis JEP Hebrew School, here in our Shul and David Bernstein is the Baal Koreh at the 7 O’clock Shachris Minyan. Shaya Rotbard in honor of his newborn grand-daughter, Kayla Rotbard and to commemorate the Yahrtzheit of his Mother, Diana Rotbard. Rochel-Leah and Shaya Rotbard on the birth of their grand-daughter, Micha'ela Binah Rotbard, born to their children, Mara and David Rotbard. 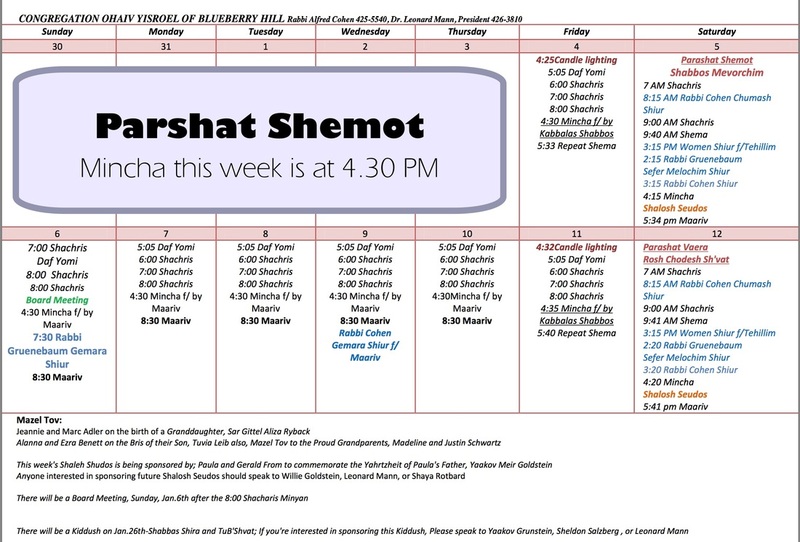 This week's Shaleh Shudos is being sponsored by; Moish Meisner to commemorate the Yahrtzheit of his mother. There will be a Kiddush on Jan.26th-Shabbas Shira and TuB'Shvat; if you're interested in sponsoring this Kiddush, Please speak to Yaakov Grunstein, or Leonard Mann. The Shul is sponsoring a Fri Night Family Dinner on Feb 1; if you're interested in attending, or helping coordinate it, please speak to Yaakov Grunstein. We'll have a flyer and online signup available shortly. Jeannie and Marc Adler on the birth of a granddaughter, Sar Gittel Aliza Ryback. Alanna and Ezra Benett on the Bris of their son, Tuvia Leib. Also, Mazel Tov to the proud grandparents, Madeline and Justin Schwartz. There will be a Board Meeting, Sunday, Jan.6th after the 8:00 Shacharis Minyan. There will be a Kiddush on Jan.26th-Shabbas Shira and TuB'Shvat; If you're interested in sponsoring this Kiddush, please speak to Yaakov Grunstein or Leonard Mann.